Simon Cabaret Phuket is a unique attraction on the Island and one of the biggest transvestite cabaret shows in Thailand. Phuket’s Simon Cabaret Show features transvestites commonly known as lady-boys, attracting countless visitors every night. Most of the performers in the show are transvestites or transgendered meaning they have undergone extensive surgery to transform themselves from biological males to females. In Thailand they are called Katoeys, they are neither male nor female and they are socially accepted as their own gender and more commonly known as "Lady boys". The performance is a musical floor show featuring stunning costumes, performed by some of the most beautiful ladyboys in Phuket. Simon Cabaret Theatre first opened in October 1991; the large theatre can seat over 600 people and has state of the art sound and lighting. The seating is similar to a movie theatre with comfortable seats and good air conditioning. 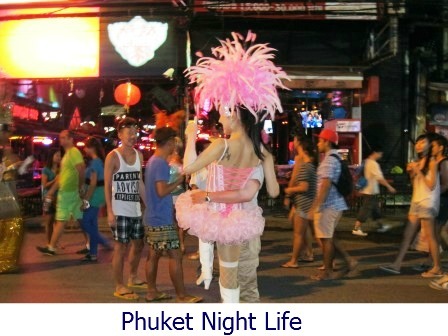 Many visitors to Phuket go to the cabaret mainly to see the Katoeys, of which most are very attractive and you can see why many people often mistake them for women. Apart from the lip syncing, the show is rather enjoyable to see and is worth adding to your list of night time activities and things to do while you’re on holiday in Phuket. Simon Cabaret is located at the southern end of Patong Beach along the road towards Karon Beach. There are three cabaret shows on every night, 7 days per week. The first show is at 6.00pm, the second sitting is at 7.45pm and final show commences at 9.30pm. The advertised price for a VIP seat is 800 baht per adult and 600 baht per child. Regular seats are 700 baht per adult and 500 baht per child. You can book your tickets for Simon Cabaret Phuket through your travel agent, at a tour shop in Phuket or from your hotel or resort. Or alternatively you can book your tickets online before you leave home. You will not be able to take photos during the show, it is not allowed. After the show the cast of ladyboys will line up outside and you can take as many photos as you like, with them or by themselves. But just beware you will have to pay for each photo you take.